This first-of-its-kind initiative in Michigan supports nurses’ call for hospital reforms to ease the burden of excessive medical bills. Nurses saves lives every day. 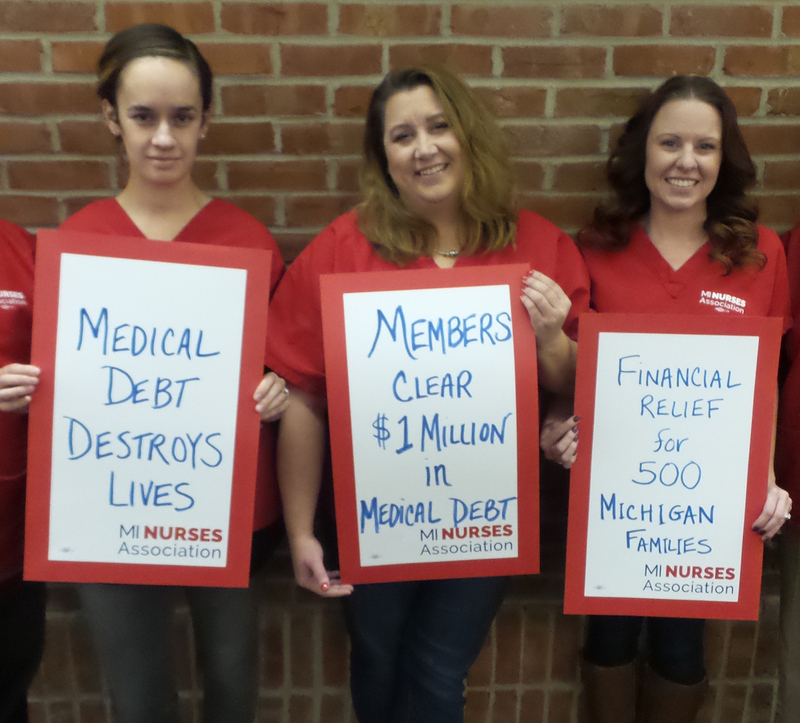 And with a recent project spearheaded by Michigan Nurses Association (MNA) members at Sparrow Hospital in Lansing, nurses saved patients across the state from financial ruin, clearing more than $1 million in medical debt for more than 500 Michigan families. It’s the first project of its kind in Michigan, and it addresses the No. 1 cause of personal bankruptcy: excessive medical bills. In addition to extending a helping hand to Michigan families, the MNA debt relief effort supports nurses’ call for hospital reforms to ease families of this burden. MNA worked with RIP Medical Debt, a New York-based charity, to erase medical debt for more than 500 Michigan individuals or families in Greater Lansing and other parts of the state. RIP Medical Debt uses donations to forgive medical debt, acquiring past due accounts that had been written off by a hospital or original provider and sold to an agency to collect on them and profit from the debt. Because RIP Medical Debt acquires debt for pennies on the dollar, MNA was able to pay about $10,000 to clear more than $1 million in debt for families in Lansing/East Lansing, the Flint area, Kalamazoo and parts of Southeast Michigan, including the Detroit area and Ann Arbor. Recipients are informed that they are free of that debt and its blemish on their credit report. The names and details of those accounts are not disclosed, to protect recipients’ privacy. To prevent more families from falling prey to excessive medical debt, PECSH/MNA members are calling for Sparrow Hospital to live up to its promises as a nonprofit. Nonprofit status allows the hospital to avoid millions of dollars in taxes. Although Sparrow is supposed to help the community in return, its financial assistance for patients has been declining over the years even as Sparrow revenues have grown. MNA’s nurses and other healthcare professionals are asking Sparrow to contractually agree to guarantee that its policies that offer free or discounted healthcare to financially eligible individuals or families will continue. Currently, Sparrow can arbitrarily change these policies at any time. The coalition is also asking Sparrow to stop reporting patients with unresolved medical debt to credit scoring agencies. About one in five people have delinquent medical debt on their credit reports, according to RIP Medical Debt. The top reason for personal bankruptcy in America is medical debt. Even people with insurance face debt due to uncovered costs. PECSH/MNA has asked Sparrow repeatedly to reveal how many of its own employees are in debt to the hospital for medical care. Jessica Lannon of Haslett, a registered nurse at Sparrow who works in labor and delivery, recalls the enormous stress of getting a bill some years back for $22,000 after an emergency put her in an ICU for two days. She was a single mom of three young kids, working her way through school by cleaning houses. She ultimately got connected to an anonymous charity that paid off her debt. Not only did it transform her life and the lives of her children, who are now in college, it underscored how medical debt harms patients. I was able to finish school and become a nurse, which was my dream. Since then, I’ve always made it a priority to give back. When you’re already in debt because of your healthcare, you let chronic illnesses go until it’s an emergency, people don’t go to the doctor, they don’t get their medications filled. While MNA members are pleased to give 500 Michigan families a clean slate, they want hospitals — especially those that enjoy nonprofit status like Sparrow — to make changes so that fewer patients suffer from medical debt in the first place.